Magazines in the UAE are not what they used to be and, unlike in some other places, that's a good thing. We now have access to a larger number of less predictable titles, as well as more interesting places to buy and read them. Case in point: The Magazine Shop in Dubai, pictured above. At the open-air pop-up shop in DIFC, stalwarts of the Middle Eastern mag pile, such as Canvas, Bidoun and Brownbook, now share shelf space with spirited uppers-and-comers like Watad, We Are Here, The Outpost and The Carton. I call them the 'Generation X of Mid-East Magazines' because they are experimental, exquisite and unapologetically expensive. In some ways, these new magazines hark back to an era of long-form journalism and profitable print media that has already come to an end elsewhere. Their appearance signals a certain optimism about the future of print in the Middle East. In a region that has a historically low ratio of readership, the risk and the potential of setting up such ventures is considerable. Fingers crossed they succeed in nurturing the audiences, business models and freedoms they need to make it in the long run. Watad (Arabic for a kind of nail used to erect a tent) is a new architecture magazine made in the UAE. As is usual for local media start-ups, there is government support, in this case in the shape of funding from the Emirates Foundation for Youth Development. Edited by a mostly Emirati team and almost devoid of adverts, each of the first three issues of Watad has presented a themed, conceptual package of original writing, graphics and photography exploring less obvious, at times moribund, kinds of architecture such as old train stations and desolate school buildings. Watad's range of subjects and contributors spans the Middle East and its playful, even poetic approach offers something entirely different than the more polished, some may say elitist, pages of other Dubai-based titles. The absence of ads is, of course, lovely for the reader, but it makes me wonder how long their funding will last. 1. A small, but essential component of the design discourse in the Middle East. 2. 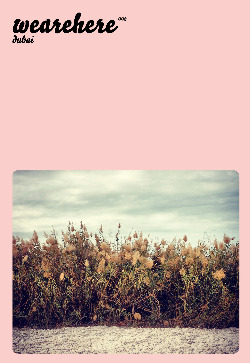 A reaction to the existing landscape. 3. An alteration in the perseption of the built environment. 4. A documentation of the thought process by which our cities are built. 5. A channel to project possibilities. Any magazine start-up that gets "Two thumbs up!" from Tyler Brûlé is off to a flying start. Like Brownbook, The Outpost appears to take more than a little inspiration from Monocle - the paper stock, the neat lines, the ample use of cute graphics. But The Outpost has something few magazines that look this good have: teeth. While it tends to brim with optimism, it can also flash its canines and rip into topics it cares about. The three issues published to date have not shied away from critical commentary about political and social problems affecting the region, including discrimination against the LGBT community. The Outpost proposes a new vista over the Middle East and I like it. 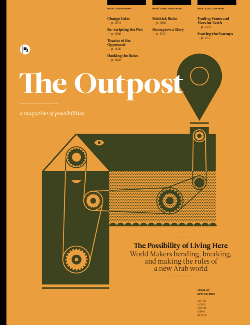 The Outpost is a magazine of possibilities. It identifies, understands and analyzes the conflicts, morals, energies and opportunities of a changing Arab world and lays down possible futures. It aims to ignite a socio-cultural renaissance in the Arab world through inspiring its readers to explore a world of possibilities. Discovering The Carton was a little uncanny. It is like someone read my mind and figured out all the things I love in a magazine. The Carton is full of them: irreverent cultural commentary, perky writing, vivid photography, kinetic illustrations and - saving the best for last - food, glorious food! Rather than presenting one recipe after the other, The Carton focuses on stories and people related to the growing, rearing, cooking and devouring of food. It envisages food as an agent and catalyst of anything from ideas, experiences and styles to memories, opinions and identities. Thoroughly likable. 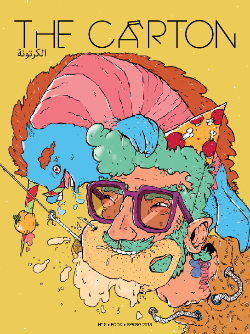 The Carton is a quarterly publication about food culture and the Middle East. We Are Here was meant to bring out its second issue on June 15, but it looks like there is a delay and I haven't been able to get a hold of the first issue yet either. According to a note posted on Magpile, they "hit some problems with the censor" and "are aiming to publish via crowd funding". Nevertheless, I wanted to include the magazine here because I hear good things and I like the concept: We Are Here explores a different location in each issue, with the first issue taking a look at Kathmandu and the second dedicated to Dubai. Can't wait to finally see it. Selling at over 30 US dollars, expectations are high. We Are Here is a quarterly travel magazine with a difference. A lo-fi, long form look at a different city or district each issue.